Meet Freddy! He is a 2 yr old Male Boxer/Hound mix that weighs appx 40 lbs and has been at the shelter since 7/23. He is so handsome but you can see in his eyes, sadness of being at the shelter is taking its toll on him. He has been withdrawn and so unsure of why he is there and what will happen next. Several of our volunteers have worked with him and he has to be carried out into the yard. He is a very calm, very sweet and gentle boy that needs of lot of TLC that will help him come out of his shell and show the wonderful dog he is. He shows no aggression to any dogs or people. He is a special boy to several of us at the shelter and we will continue to work with him. He rolled over for a tummy rub, so you can see he wants to try, he just needs someone to give him time, patience and love, and his eyes will sparkle and tail will wag again. Please don’t count him out. There has to be someone out there that can see the same potential we can. Is that person you?? If you can help him, please email the shelter at rescues@cityofmesquite.com typing ID # 39197440 in subject line. 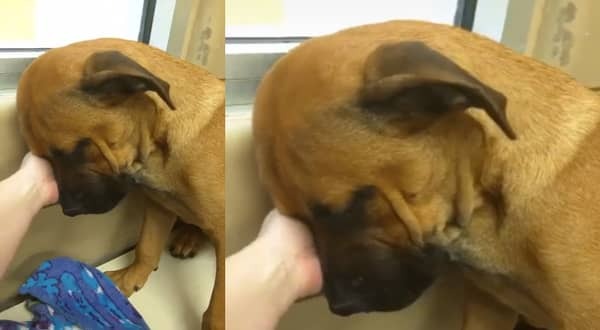 13 Responses to "Terrified puppy clings to his volunteer as he got the news formally placed on death row"
As of today, there is no update on him . He needs out ASAP! Bring him to me I will take him. Please!! Are there anymore updates? ?